The best team building and leadership development activities in the GTA. If you’re looking to reward or develop your team with an awesome experience, we can help you organize the ultimate event. Our 8 player VR experience involves every element required in a high performing team: Goal Setting, Alignment, Feedback, Communication, Collaboration, and Trust. There’s nothing like a truly engaging, immersive and unique experience to bring a team together. Get your team out of their day-to-day environment and challenge them with an event they’ll talk about all year! Perfect for team building, leadership development, corporate entertainment, EOFY and holiday parties. Our venue managers will take the stress out of organizing an event and assist you through the process to make sure your session is a complete success. We cater for 6 to 90 people and tailor the in-game experience to suit your needs and budget. Corporate Events are available Monday to Friday. To enquire about a booking please send an e-mail to events@virtualgalaxies.com and include your preferred date and time. 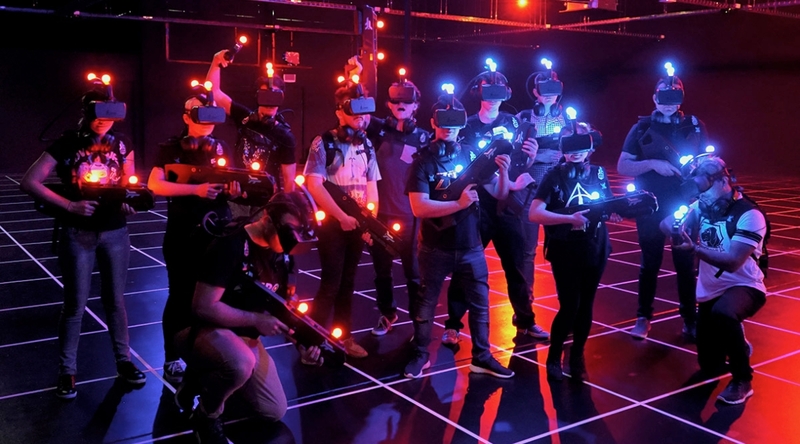 If you have students, or if you are looking to celebrate a birthday or other event, and are ready to try out the most engaging, immersive VR experiences on the planet then we can help you. Combine your skills and interests for this unique group experience. We can hold school, university, and private bookings during the day at a time that best suits you and help cater an in-game length that will work best for your group. Our experiences are recommended for ages 13 plus. To enquire about a booking please send an e-mail to events@virtualgalaxies.com and include your preferred date and time. If you have a group of 8 or fewer and are not looking to exceed an hour session, you can book a session through the bookings page.